We humans like to fill things up. It’s true. We stuff our pockets, backpacks, purses until they overflow. We can’t ignore holes in the lawn. We fill grocery and garbage bags alike to the very top before we realize their weight. Ever have to sit on your suitcase to zip it closed? We’re all guilty of it in some way. Many of us have competed with friends to fit the most of some small edible treat in our mouths. I myself won the skittles contest we held on the wing of my college dorm during a blizzard. Eighty-nine at one time! It would’ve been 90 but I accidentally swallowed one. Why, exactly, we feel this impulse is unknown. Personally, I believe scientists and sociologists will someday discover there is a gene - a stuffing gene - that compels us to fill empty spaces, like gangs of eternal optimists. This primal urge doesn’t just apply to pockets and holes in the wall. Our most favorite place to stuff is… well, you know where. Something about food filled with additional flavor and texture generates a feeling of adventure, decadence, and brings an overall unique quality to that eating experience. Even a green olive becomes more intriguing with that little piece of pimento peeking out at you. It would make sense, then, for the most special of meals, we go the extra mile to build those exact qualities into the feast. As our traditions have evolved, so has our understanding of how food works. There are a few questions out there that seem to arise annually, just about this time of year, when chefs and home cooks are planning out the big menu. Really, it’s all about the stuffing, right? Or do you call it dressing? I set out this year in search of some answers and some solutions to the ever-evolving Thanksgiving debates. Although I will not be able to help you with arguments about who’s going to win the big game, we might be able to settle a few other looming questions before that debate begins. To help me out with this task, I enlisted the advice of Mike Chowansky, graduate of Johnson & Whales University, who lives with his wife and two children in Havertown and has over 10 years of experience in the Philadelphia food scene. He’s also most often the Thanksgiving Dinner chef, so he knows his turkeys. According to Chowansky, “There are more recipes for stuffing than there are pizza shops in New York City. It is the quintessential Thanksgiving dish that everyone makes, has a secret recipe for, and is used to judge the overall Thanksgiving feast.” No wonder we take it so seriously! Like gravy on mashed potatoes, stuffing has a long history of appearing on dining tables throughout centuries of celebratory banquets all over the world. The earliest recorded mention of stuffing our food appears in the oldest cookbook on record, ‘Apicius de re Coquinaria’, as recorded by Roman gourmet Apicius, so we’ve been doing this for a very long time. Somewhere around the 1st century AD, Apicius and other Romans were stuffing dormouse, hare, pig and chicken. Stuffing recommendations such as herbs, nuts, spelt, chopped liver, and occasionally brains were part of these early recipes. The Native Americans and Pilgrims most likely stuffed the first Thanksgiving turkey, but according to assumptions by specialists, they used herbs and vegetables (most likely onions), to fill the cavity and flavor the meat. It was not meant to be a separate dish for consumption. The Bedouins may take the cake… or the camel as the case may be… for the most outrageously aggressive stuffing recipe in history, the Traditional Bedouin Stuffed Camel. Yes, you heard that right... a camel. According to legend, and a few travelers who claim to have witnessed such feasts, the traditional wedding dish served at the marriages of sheiks and of their family members was a whole camel, stuffed to unbelievable proportions and cooked for several days, much like a pig roast. Mentioned by T.C. Boyle in Water Music, the Guinness Book of World Records as “the largest item in any menu in the world, occasionally served at Bedouin wedding feasts” and appearing on a “Breakfast Tips” card included with the remastered CD version of Pink Floyd’s album Atom Heart Mother, the recipe goes something like this. 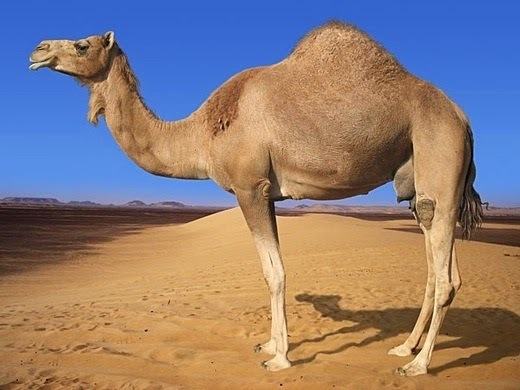 ‘ Medium sized camel. Skinned, trimmed and cleaned. 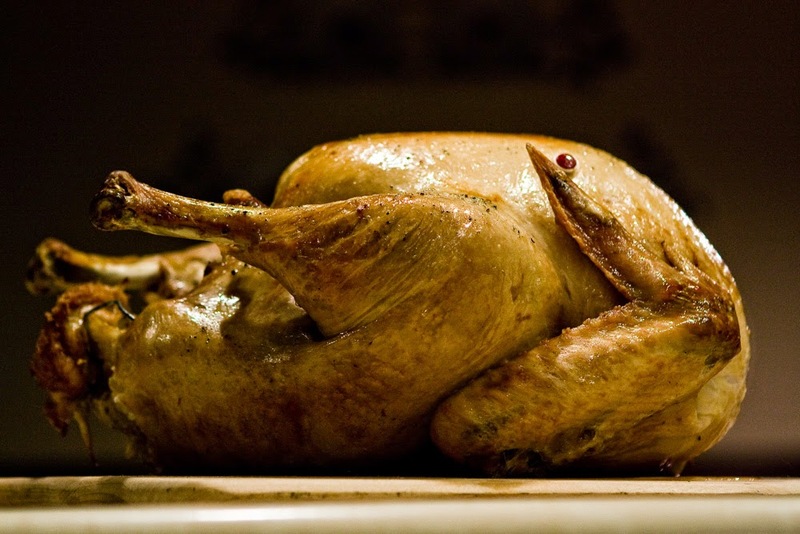 Stuffed with sheep - stuffed with seasoned bustards – stuffed with carp – stuffed with eggs and/or dates, and baked on hot coals for several days.’ Take that, Turducken! So Is It Dressing or Stuffing, Then? 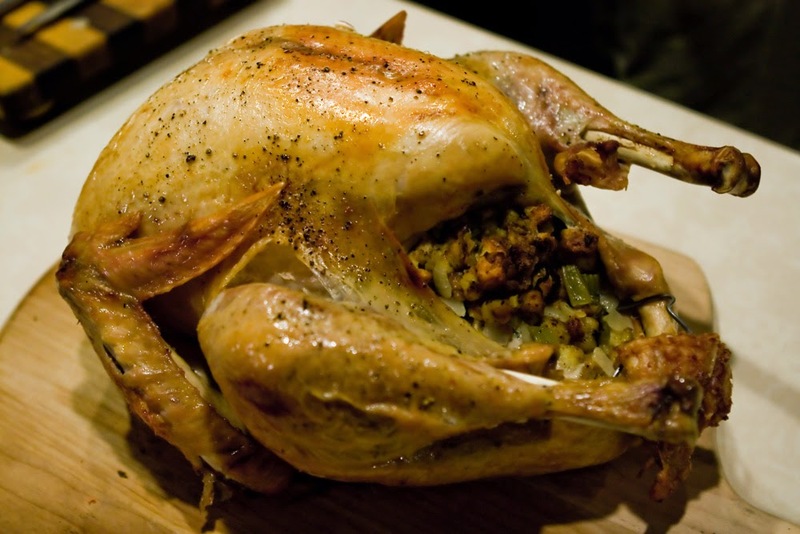 According to the National Turkey Association, the terms stuffing and dressing can be used interchangeably. I didn’t want to believe this was true. So, once again, I sought out my expert. And to my dismay, Chowansky agrees definitively, “Tomato, Tom(ah)to. Stuffing. Dressing. It’s all the same!” Whether you are passing the dressing or the stuffing, they are both “used to fill the cavity of the bird. Dressing comes to us from the much more refined folks living below the Mason Dixon Line. They wouldn’t be caught dead saying stuffing. That was much too common.” So, there you have it. This is a personal decision having nothing to do with where the filling cooked, but where the cook was born and raised. No matter what you call it, where you put it does matter, and will dictate the timing of your meal. You’ve heard the warnings and concerns regarding the potential food safety issues related to cooking your stuffing inside your turkey. FACT – Turkeys and other animals contain bacteria that will make us humans sick. The bacteria dies at certain temperatures, which is why we are so careful about cooking them. FACT: These bacteria, especially those living in the turkey before you cook it, love your grandma’s stuffing as much as you do. You may wish to bathe in it, but the bacteria don’t have to wish, they soak in it - at least until everything reaches 165°F. And that means everything, right down to the center of the stuffing inside the cavity. Ready to Separate the Bread from the Bird? If you’re ready to start new stuffing... or dressing... traditions, and you're ready to roast the bird all by himself, consider these tasty tricks and compromises. * Place fresh herbs such as sage, marjoram, thyme, rosemary or even thin slices of lemon if you like citrus directly under the skin of the bird before you put it in the oven to cook. * When you make your stuffing, adding an egg (if you don’t already) will keep the bread moist and fluffy. * If you miss that “wet stuffing” texture, try covering the stuffing with foil as soon as it’s finished baking to create a tight seal. Do not remove until you serve. The foil will condense and lock in moisture, increasing that “wet” feel as if it’s come from the bird (although you are giving up those crispy little ends.) If left standing too long it can get soggy. Keep your eye on it! If you’re steadfast in your stuffing/dressing/filling traditions, know that the safe-zone for internal temperature is 165°F, for turkey AND the very center of the inserted filling. See the following links for information on the USDA and National Turkey Association pages to ensure you’re meeting safety standards! Always use a meat thermometer, and ensure the thermometer is calibrated. Consider Putting It Somewhere Else Entirely! I’m a vegetarian, so I agree with Mike, but for my own completely selfish reasons. Keep the stuffing separate. I can’t eat it if it’s come out of the bird (even if I secretly want slap it on my plate and slather it with turkey gravy). I realize that’s a lot to ask at times, depending on whose table I’m joining. I often bring my own. So many traditional dishes all over the world stuff some form of pepper or other sturdy vegetable common to the various regions. Spanish, Mexican, Mediterranean, Indian, Middle Eastern and Romanian cuisines all brag their own special blends of grains, herbs, spices and meats for their traditional stuffed vegetable dishes. From dolma to pimientos rellenos, there’s quite literally a whole world of recipes out there to fill your fruits and veggies. This time of year it seems most of the fruits and veggies in autumn harvest are practically cooking vessels by design. Over the years, I have experimented with a variety of recipes like this, seeking to replace some of those familiar comforts of the Thanksgiving feast without forgoing all the comfort. Veggies are delicious, but they aren’t very cozy all by themselves. With the debates about the food safety issues presented by our modern holiday habit of filling the raw turkey and cooking the stuffing inside, I thought it might be time to share some of my more refined recipes for bacteria-free stuffed fare and encourage all you chefs out there to consider a shift in your perspective on Thanksgiving stuffing. You don’t HAVE to stuff the bird. You don’t HAVE to stuff an animal at all! Go ahead and remove that apple from the piggy’s mouth, carve it out, and put something delicious in there. The food is the casing, the insides that you dig out become part of the recipe, can at times be set aside for later use (like roasting your squash seeds), or go right back into your compost pile. No waste. At the end of the meal, if anything remains of your apples, squashes and peppers, you can rinse the remnants well and place them into the compost pile as well! I like to think of it as eco-thankful! And in a way, a return to tradition. It’s easy to appreciate the sustenance of the harvest when the beauty of the pumpkins, peppers and apples are roasted and set on the table in their colorful original form. This is much closer to the way our ancestors thought about and utilized their food back on that fateful day in Plymouth. Neither Native American nor Colonist was interested in wasting any part of the food that would soon become scarce. They might have stuffed their fowl with onions and garden herbs instead of bread cubes, but they utilized every possible piece. I often wonder this time of year what the first people who sat for that Thanksgiving feast would think of our modern grocery stores and walk-in freezers. Here are some of my favorite recipes that would not only fit right in at your holiday table, but have definite potential to become a traditional feasting favorite. Prepare to hear requests when the next holiday rolls around. It’s all stuffed! 4 large, crisp apples (carved and insides diced). 1 egg slightly beaten. 1 cup milk or half and half. 1 cup 1-inch moist bread cubes (one-inch cubes best). 2 tsp Vanilla. 3 tbs cinnamon. 1 tbs dried sage. 1 tbs ¼ teaspoon nutmeg. ¼ teaspoon cardamom. 1/8 tsp salt. ½ cup brown sugar. ¼ cup raisins (optional). Muffin Tin. Butter for greasing tin. Prepare the Apple: Cut apples at top like a jack-o-lantern. Gently cut out most of the cores and set aside for compost. 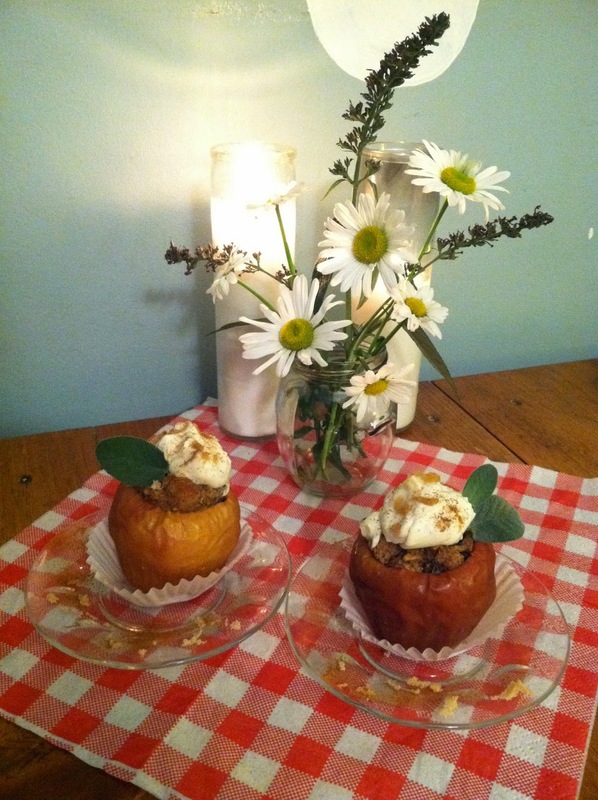 Be sure to leave the bottom ½” of the core at the bottom as support for the body of the apple. Gently cut or carve out the meat inside the apple making a cavern for the batter, leaving a thick layer of meat (at least ¼” thick) against the skin. Set apple pieces aside, and chop into small pieces to add to batter. Rub the skin of the apple lightly with olive or vegetable oil and place in muffin tin for support while baking. Prepare the Stuffing: Combine all above ingredients in a bowl. Stir until well blended with a wooden spoon or spatula. Do not use a mixer for this. Continue folding until bread cubes soak up the liquid and begin to break apart. Allow batter to sit for a few minutes until all the liquid is completely soaked up and batter is fluffy. 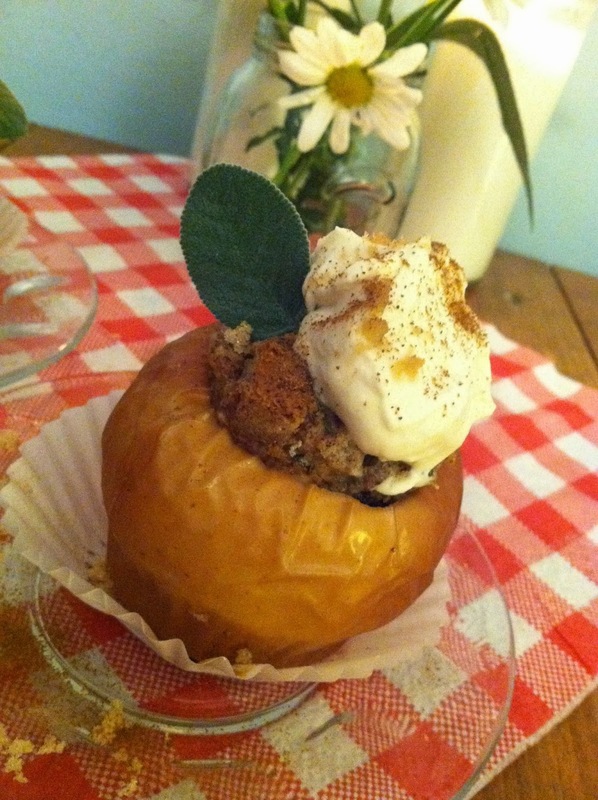 Fill each apple half-way and sprinkle a little brown sugar on top. Place in oven. Bake until apple is soft (but not falling apart) and the stuffing rises and is no longer runny. Serve warm with a dollop of whipped cream or vanilla ice cream. Cook’s Notes: This batter expands to almost double in size. Consider this when filling your apples! Sometimes it is easier to use a fifth apple to make the diced apple portion. Depends on how good you are at carving out the meat. I always keep and extra apple set aside when making this. For grown-up deserts, you can substitute Baileys, Kahlua or Cask and Cream for the milk. 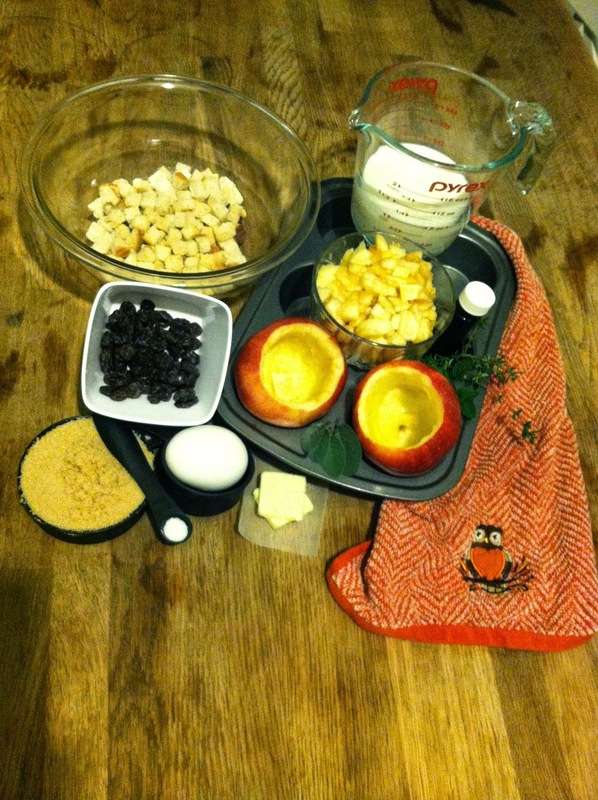 List of Ingredients: 4 mini-baking pumpkins about 4 inches in diameter. If your mini pumpkins are 5-6 inches in diameter, double the recipe and bake what remains in muffin tin or custard cups. 8 oz cream cheese softened. 1/3 cup brown sugar, 1 egg plus 1 additional yolk. 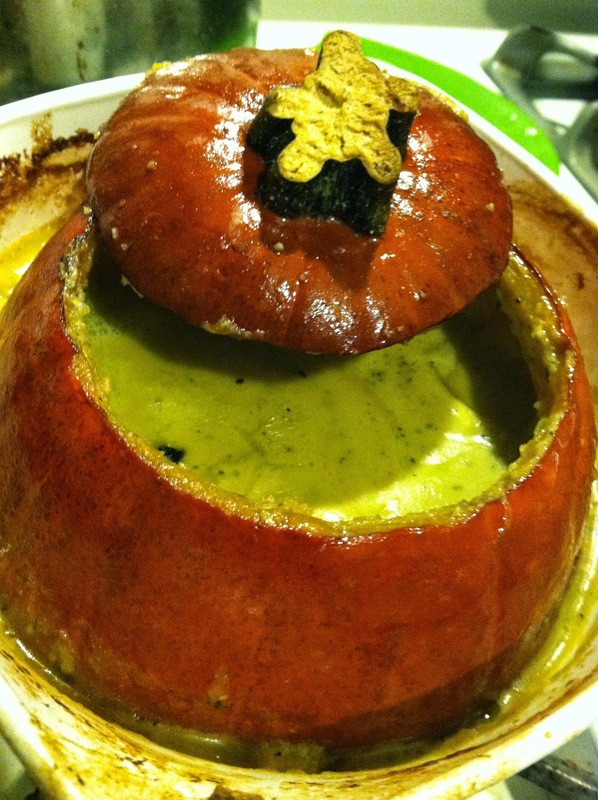 1/3 cup pumpkin puree. 1 teaspoon vanilla. 1 tsp cinnamon. ¼ tsp sage. ¼ tsp cardamom. ¼ tsp nutmeg. (1/4 tsp cloves. I leave them out due to certain allergic reactions cloves can cause). Prepare the Pumpkin: Cut top off and gut like a jack-o-lantern, leaving a thick layer of the pumpkin meat to support the frame. Set seeds aside to be roasted later on. Rub the outside & tops of the pumpkins with vegetable oil. Set in lightly oiled baking dishes for support. Prepare the Stuffing: Mix the cream cheese, sugar, egg and yolk until they form a soft paste. Add pumpkin, vanilla, herbs & spices and continue to mix until smooth and well blended. Pour mixture into hollowed out pumpkins about halfway (2/3 if the pumpkins are closer to 6”) Bake in oven until filling rises and sets like a cheesecake, about 25-30 minutes. Remove from oven. Chill for at least an hour before serving. Top with whipped cream and pieces of shortbread pie-crust cookies. Cook’s Notes: This batter will expand to at least double in size (if not more before it cools and settles). DO NOT FILL MORE THAN HALFWAY! List of Ingredients: 12-16 (depending on size) small to medium sized cherry hot peppers, fresh. 1/2 cup grated parmesan cheese, 6-8 oz. goat cheese. 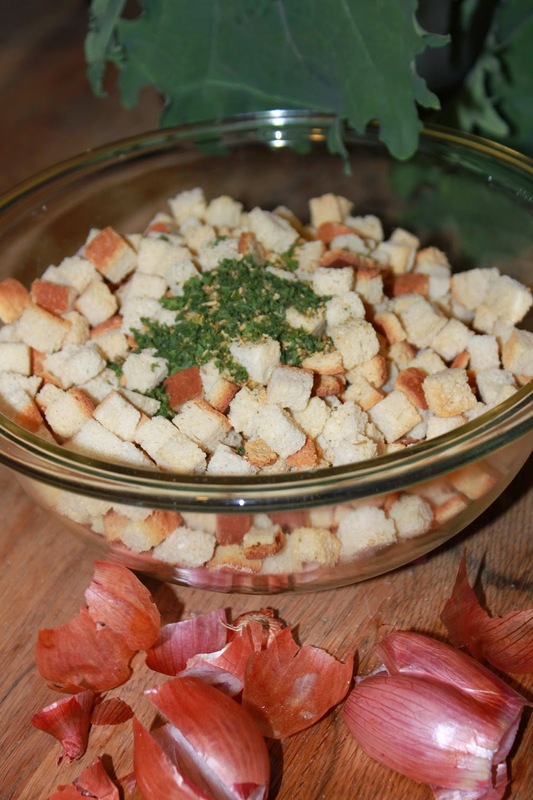 ½ cup soft bread cubes diced. 3 tbs vegetable broth. 1 tbs fresh oregano chopped. 1 tbs fresh parsley, chopped. ¼ tsp ground pepper. ¼ tsp ground sea salt. *You can add 1/4 cup vegetarian crumbles or cooked, ground beef to these. I like them without. Prepare the Cherry Hot Peppers: Cut the top off the peppers and scrape out seeds and pithy white insides. Peppers can be cut at the top or down the middle. Rinse peppers and dry. Set each pepper in a muffin tin, or line a cookie sheet with parchment paper. Rub the peppers inside and out with olive oil and set on baking sheets. Prepare the Stuffing: Combine bread cubes, vegetable broth and parmesan. Stir until the bread breaks down and blends into itself. Add goat cheese, oregano, parsley, salt and pepper. Stir until well combined. Fill cherry red peppers on baking sheets. Sprinkle bread crumbs over the tops. You can also use parmesan or mozzarella if you're playing with flavors. 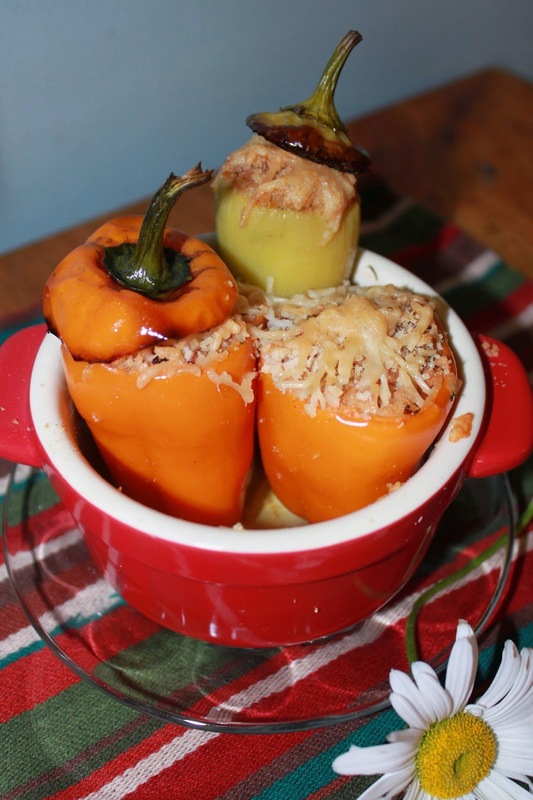 Bake for 15-20 minutes until edges of peppers are soft and starting to crisp on the edges, topping is turning golden brown, and mixture is no longer bubbling heavily. Let stand for 5 minutes and serve. Cook’s Notes: When preparing the cherry red hot peppers, USE GLOVES! Also, if you can work in a well-ventilated area, you should. As soon as the seeds hit water and you continue to agitate the pepper releasing those oils, the fumes will cause skin, nose, eye and even throat reactions. I like to serve the cherry hots with a little sour cream on the side for those who don't enjoy the good burn of a hot pepper quite as much as I do. 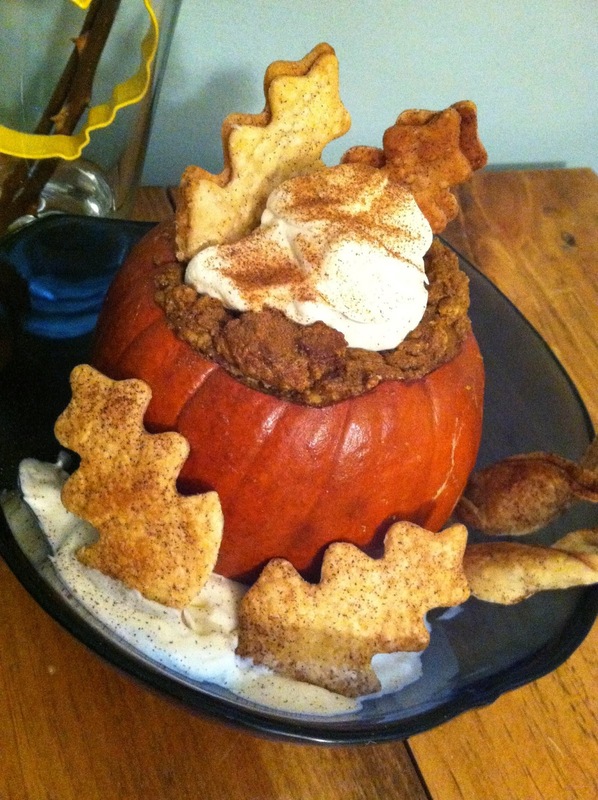 List of Ingredients: One very large baking pumpkin, hubbard squash or butternut squash. 4 small shallots, diced. 1 small apple, peeled, cored and diced (no more than 1 cup diced). 1 large clove garlic, diced. 1-2 cups vegetable broth (start with 1 cup and add depending on size of gourd). 1/2 cup heavy cream. 1tbs unsalted butter. 4 - 8oz goat cheese. 2 tbs fresh chopped sage. 2 tbs fresh chopped thyme. 2 tbs fresh chopped parsley. 1 tbs kosher salt. 1 tsp. ground black pepper. 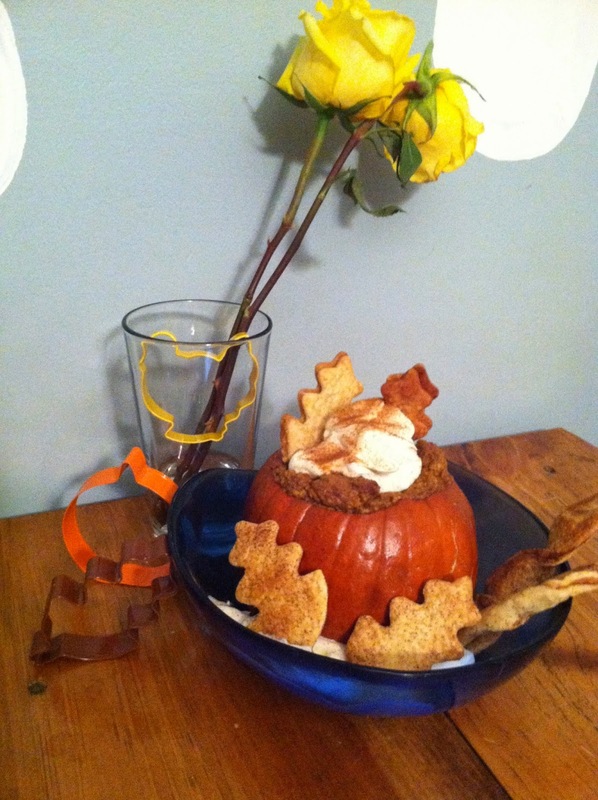 Casserole dish to support pumpkin(s). Emersion mixer. Vegetable oil to rub pumpkin skin and top and grease casserole dishes. Prepare Pumpkin as you would for a jack-o-lantern. Gut, set seeds aside, leave as much meat as possible lining the edges of the pumpkin. Cooks Notes: If you are reserving the pumpkin seeds, they make a great garnish all roasted up! Click the link to connect to the Winter Squash Seed blog for a how-to.